For its first show in nearly 5 years, the EBOW gallery in Dublin will re-open to the public next month to play host to the Irish instalment of the Bowie by Duffy exhibition. Curated by Chris Duffy and David Douglas, the exhibition is free to get in and it runs from Saturday April 15th for approximately three weeks. As previously mentioned, Shot! The Psycho-Spiritual Mantra of Rock, features unseen archival footage and unearthed audio recordings of some of Mick Rock’s most famous subjects, including Bowie, Queen, Lou Reed, Iggy Pop and Pink Floyd founder Syd Barrett. Rolling Stone has the exclusive on one such piece, with a 45-year-old tantalising glimpse of Bowie and The Spiders backstage at Dunstable Civic Hall, on June 21st, 1972. View it here. In addition to Rock's landmark work and his relationships with rock legends, the documentary also focuses on the photographer's battle with drug addiction and a near-death experience he had in his youth. Shot! will be released in theatres on April 7th, the same day the film heads to Amazon Video, iTunes and other services. In a September 2015 interview with Rolling Stone, Rock spoke at length about working with Bowie early in the icon's career. Watch the superb trailer for SHOT! Over on Apple now. Raymond Weil CEO, Elie Bernheim (pictured), proudly introduced the Limited Edition David Bowie freelancer at the #baselworld2017 fair today. Mr Bernheim had this to say regarding Bowie. Aside from the Bowie references on the watch face, another cool feature is the iconic Terry O’Neill photograph from 1974 printed on the sapphire of the watch’s case-back. Terry spoke of his honour to have been involved with the project. Produced in a 3,000-piece limited, numbered series, the freelancer David Bowie will be released later in the year. Another disc just announced for Record Store Day (RSD) 2017, is the first ever vinyl pressing of ‘Without You I’m Nothing’, the Placebo single featuring the vocals of David Bowie, affectionately nicknamed PLACEBOWIE. Meanwhile, we’re happy to be able to tell you that the BBC has an exclusive first play of the “Bombers / Andy Warhol Intro” from the BOWIEPROMO RSD release. The track airs on the Shaun Keaveny show on BBC Radio 6 Music tomorrow morning (March 22nd). The show starts at 7:00am. Iggy Pop’s The Idiot album was released on March 18th, 1977, and its influence is still being felt forty years later. Along with Bowie’s own Low album, The Idiot was a real game-changer for artist and listener alike. It’s probably a cliché to say how new both these albums sounded back in 1977, but nevertheless, it’s true. They sounded like they shouldn’t have been made yet and although they were both instant classics to the faithful, both records are still generally underappreciated. Though Low was released a couple of months ahead of The Idiot, the latter was made first. The Idiot was recorded at the Château d'Hérouville (France) and Hansa Studios, Berlin in 1976. As stated on the back of the original sleeve, Iggy’s album was: Recorded by David Bowie and mixed by Tony Visconti, whereas Low was a Bowie/Visconti production. 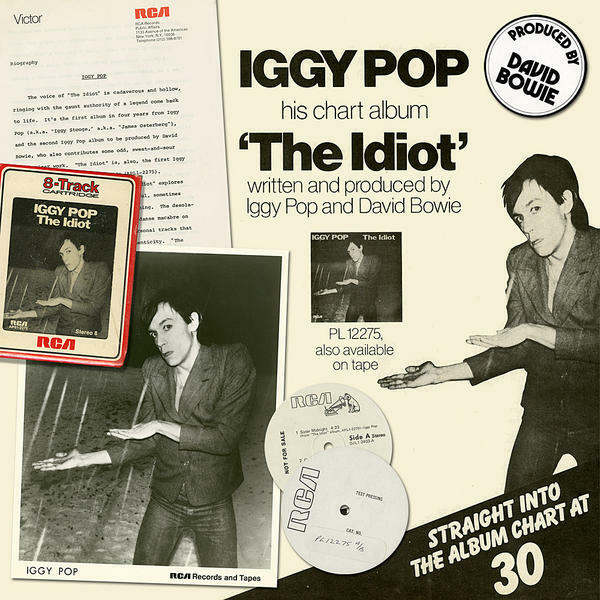 Despite this lack of a production credit for The Idiot, later issues of the album had a large Produced by David Bowie label on the front cover. The Idiot entered the UK album chart and peaked at #30 upon release. China Girl and Success were released as singles but failed to bother the singles chart. Bowie’s success with his own version of China Girl six years later, apparently provided Iggy with his pension fund. But that’s a whole other story. Shortly after Bowie passed last year, Iggy spoke to Jon Parelesjan of the New York Times in more detail about his working relationship with Bowie in the recording studio. It's a fascinating and emotional piece. Check it out here. In celebration of 40 years of Iggy Pop’s The Idiot, here’s a few pics of its creators in 1977. The colour shot of Bowie at the keyboard was taken by Andy Kent at a soundcheck during The Idiot Tour. The picture of Bowie on the left was taken by Koh Hasebe at the combined Japanese press conference for Low and The Idiot. Both Bowie and Iggy faced the press on the day, with much tomfoolery in evidence by the pair. The mono pic is another shot of the boys having a bit of a laugh, slightly at odds with the mood set by Low and The Idiot. Right about now (forty five years ago to the hour), the audience at Birmingham Town Hall were among the first people in the UK to experience the life-changing delights of the Ziggy Stardust stage show. Before our man took to the stage with his merry band of space invaders, Mick Rock had his first meeting with the 25-year-old Bowie. Here’s what the Man Who Shot The 70s had to say about that moment. That was the first time I met him. In fact, I think this was the very first frame I shot of him. I shot about four frames backstage. In those early days, because of their modest income, magazines would get you to do the words and the pictures. I do remember a kind of obvious exchange, of David saying “Oh I like your name, mate, is it real?” Because it sounded a bit like a parody. I mean, a photographer called Mick Rock... You couldn’t have a performer called that, it would be too much. Besides Mick Jagger had already taken up any space that was allocated to the Micks of this world. We swapped anecdotes; he wanted to hear about Syd and I wanted to know about Lou Reed and Iggy Pop. We talked about how Syd had had it all. Syd and David were similar in the way that neither of them sang like an American. At that time there was a big American influence on music, but Syd and David went against that and sang in a British way. David was very aware of Syd; very interested in him. Of course, in 1973 David did a cover version of 'See Emily Play' for his Pin Ups album. There were many parallels between Syd and David early on; although clearly David had a much tougher psyche. David's 'The Man Who Sold The World' always makes me think of Syd. It's a perfect description of him." Meanwhile there are just three weeks to go (April 7) till you can see Mick’s rockumentary, SHOT!, in cinemas, on demand and via iTunes and Amazon. We’ve mentioned Donny McCaslin and his band and the magnificent work they contributed to David Bowie’s Blackstar album and the No Plan EP more than once on these pages. We also told you about Donny’s solo album, Beyond Now, in October last year. The experience of creating music with Bowie proved so deep, and its aftermath so jarring, that McCaslin decided to turn his new album, Beyond Now, out 14 October, into a tribute. It includes several transformative covers of Bowie songs, including Warszawa from Low, and A Small Plot of Land from Outside, along with a song McCaslin wrote inspired by a piece Bowie left off Blackstar. Now Donny and the band have created a stylishly moody video to accompany their haunting version of Warszawa, and Donny kindly gave us the heads up. Here it is. Keep up to date with all of Donny’s goings-on on his FB page. One of the very best gigs we attended last year, was Donny’s amazing performance at the London Jazz Festival in November. Check out a review of that show by Time Out writer, Liz tray. Make no mistake, Donny McCaslin, this genial giant sax player from California, has had a distinguished career in jazz. He's spent nearly three decades carving out a groove in modern jazz playing, starting with filling the huge shoes of Michael Brecker in the legendary fusion group Steps Ahead. With three Grammy nominations to his name, he's become the trusted right-hand man of bandleader Maria Schneider, herself a multiple Grammy winner. The dreaded term 'crossover' has come to be applied in jazz to artists who break out of the somewhat closed jazz world (closed to mainstream rock/pop fans, in that sense) and make a break across the aisle. In the 70s it was Herbie Hancock who did it, and even before then Miles Davis - the greatest jazz artist of all time - had broken the mould, with Kind Of Blue becoming the best-selling, and most famous, jazz album of all time. Historically, plenty of pop musicians (looking at you, Sting) have sought out jazz players on their records to give them a bit of cool. And as a lifelong jazz fan, Bowie was no different, taking on saxophonist David Sanborn and trumpeter Lester Bowie to play on his records, among others. Even Mike Garson, of course, is a jazz player. As we all know, Bowie was one of the great casting directors of our time. But beyond bit parts - musicians popping up - he had never given over an entire record to jazz musicians, until Blackstar. Everyone knows the story. He wanted to continue his collaboration with Schneider after their magnificent foray with Sue (Or In A Season Of Crime) in 2014. But she had already committed to The Thompson Fields project. So she pressed a copy of McCaslin's Casting For Gravity into his hand (having sent him the track Stadium Jazz first) and suggested they visit Greenwich Village's Bar 55 to see his quartet (with Mark Guiliana, Tim Lefebvre and Jason Lindner). McCaslin says he spotted Bowie sitting at a table with Schneider, and tried to keep calm, as you would, and just concentrate on playing. Shortly after, he got an invite to perform on what would turn out to be Bowie's last album. Since then, one imagines, his feet haven't touched the ground as suddenly, this brilliant, powerful quartet have become among the most famous jazz musicians in the world. During a short European tour, McCaslin's group (minus Lefebvre, whose regular gig - with the arena-filling Tedeschi Trucks Band - called; replaced by Jonathan Maron) dropped into Shoreditch's Rich Mix, packing out the overheated main room and shaking the walls. They'd dropped into London to play some stuff from his new Beyond Now album, a follow-up to last year's excellent Fast Future. You could tell the crowd had some Bowie fans at their first jazz gig present; they looked a bit shell-shocked. As I heard someone say, listening to jazz on record is hardly like seeing it live. It's so much more visceral, muscular, and frankly, louder than you can imagine, especially with a fusion quartet like the one McCaslin leads. The bass thundered. Lindner's synthesiser textures lent a cosmic vibe reminiscent of the early 70s electric work of Keith Jarrett when he was playing with Miles. Guiliana's complex, intricate drumming evoked the greats; one can feel comfortable comparing him to all-time greats like Elvin Jones and Jack DeJohnette, alongside recent masters like Brian Blade and Kendrick's drummer Ron Bruner Jr. That's how good he is. Get his 2015 album Family First, you won't regret it. McCaslin leads this band through twisting and turning renditions of songs new and old. You might have expected Warszawa to be on the setlist, and you'd be right. The band closed with it. Less expected but incredibly welcome were two more Bowie songs. First, one that caused the room to take a sharp intake of breath - Lazarus. It sends a chill, until of course the sax takes over from where the voice should be and then it takes off, with the closing section containing some absolutely remarkable playing from McCaslin, who was on fire all evening. Then, a lovely surprise, the very familiar drum part of Look Back In Anger kicks in and off we go. The room was electrified. If you'd never seen a jazz gig before, or if you'd seen 100, this was a top class night. As we post this (March 14th, 21:00 hours, UK time), there are just three hours left to secure your Royal Mail David Bowie First Day Covers (FDCs). Backing vocals - Warren Peace, Anthony Hinton, Luther Vandross, Ava Cherry, Diane Sumler and Robin Clark. 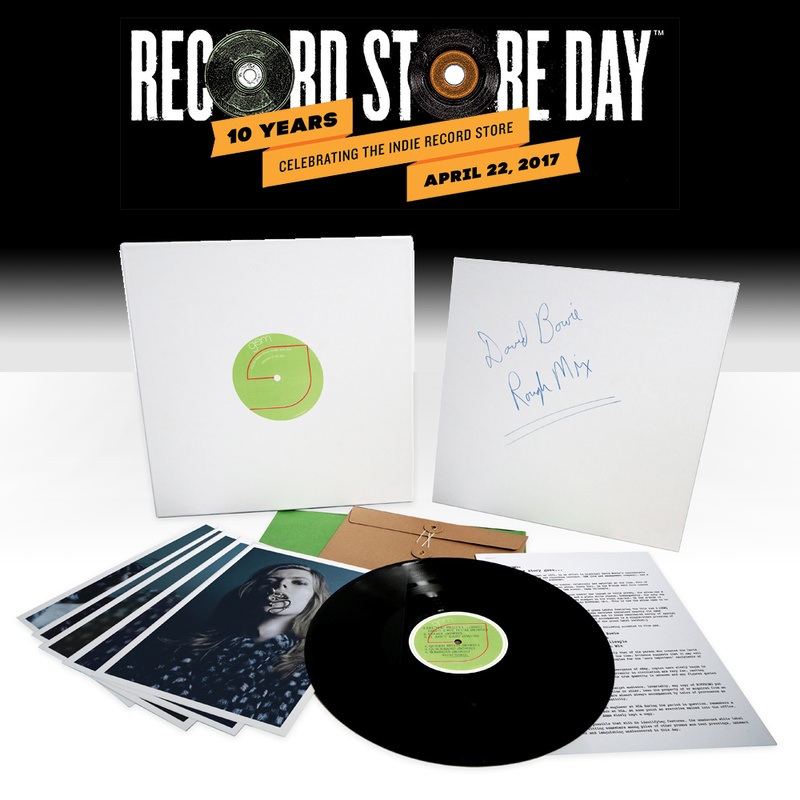 This RSD, one-sided release faithfully replicates the original promo featuring Bowie's seven tracks plus five exclusive Bowie prints and new sleeve notes regarding the original promo, all housed in a special presentation box. In January, the No Plan digital EP reached #1 on the iTunes charts of 11 countries including the UK, Netherlands, Denmark, Ireland, Norway, Finland and Sweden, and broke the Top 20 in more than 30 territories. Now the CD EP has gone straight in at #1 on the UK’s Official Physical Singles Chart Top 100. Meanwhile the 40th anniversary Sound And Vision picture disc is enjoying its third week at #1 on the UK’s Official Vinyl Singles Chart Top 40. Finally, there are still four Bowie albums on the Official Vinyl Albums Chart Top 40. Aside from the latter, all versions are available here. Read previous No Plan EP news items, here and here. As the RIAA publishes its full list of Gold and Platinum awards for February in the U.S., we would like to take this opportunity to thank all of you that helped make ★ such an incredible worldwide success since its release on David Bowie’s 69th birthday on January 8th, 2016. David Bowie's 28th and final album, ★ (ISO/Columbia), certified gold in the U.S. by the RIAA for sales in excess of 500,000 units. This followed the news from the bpi that the album had already reached Platinum status in the UK with sales in excess of 300,000. In conjunction with the Global Recording Artist award, IFPI also issued its annual Global Top 10 list. David Bowie took second place on the global chart, with ★ reaching number one in 24 countries, including Bowie's first U.S. #1. Additionally, ★ won in every one of the five categories in which it was nominated at the 59th Annual Recording Academy / GRAMMYs : Best Rock Song, Best Rock Performance, Best Alternative Music Album, Best Recording Package, and Best Engineered Album, Non-Classical. Bowie and ★ also won two BRIT Awards: British Male Solo Artist and British Album of the Year. Also in the UK, ★ was placed at #6 on the Official Artist Albums Chart of 2016 (Parlophone’s Best Of Bowie was #10 on the same chart), while Bowie was the biggest-selling vinyl artist in the UK, with 5 albums posthumously featuring in the top 30 best-sellers on the Official Vinyl Artist Albums Chart of 2016, including ★, which was 2016’s most popular vinyl recording, selling more than double the number of copies of 2015’s best vinyl seller. ★ closed out 2016 dominating critics’ year-end best of lists: The album was rated #1 by the AV Club, Flavorwire, The Los Angeles Times, MOJO, Newsweek, Now, Paste, Q, The Wire, Uncut and more, with #2 spots including the BBC, Entertainment Weekly, The New York Times, NPR and Rolling Stone, and more Best of 2016 placements in major publications than any album released last year.